These brand new sofa sets for 2017 are a fantastic way to entertain al fresco, with a combination of formal dining and relaxed living. They come with a 2 seater reclining sofa, 2 reclining arm chairs, 2 foot stools, and 1 adjustable table. All cushions are included. 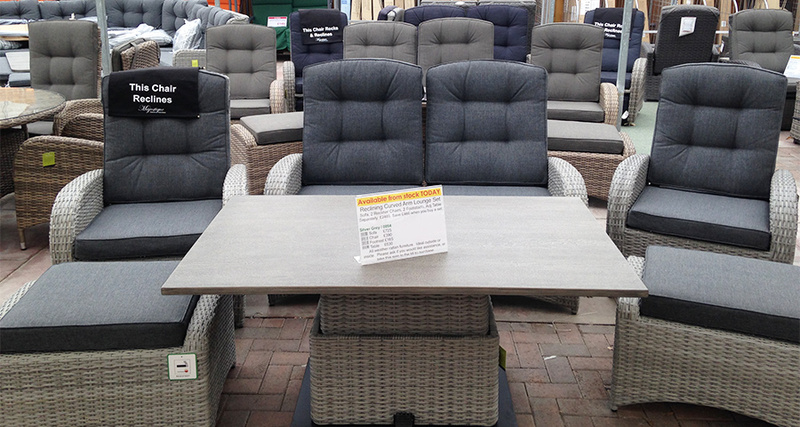 They’re available in all 4 colours of rattan, including cappuccino, latte, silver grey and stone grey. Have you ever wanted one set to allow you to eat upright and relax? Well now you can, with the new for 2017 adjustable table, as part of our reclining sofa sets. They allow you to raise the table to multiple heights, giving you the option for both a relaxed atmosphere, and a more formal dining experience (see the video for a demonstration). The quality of this reclining garden furniture is second to none, with a patented pump reclining mechanism that is unique to Majestique. Looking to purchase a set? Checkout our options on how to buy by clicking below.